This 52ft Hatteras powered by twin 900HP Yanmar engines with a cruising speed of 24 knots fishes out of Los Sueños Marina in Playa Herradura. Captain Ian Mcallister is at the helm, aided by mate Juan Diego Ovares. The entire boat was refurbished inside and out a few years ago. 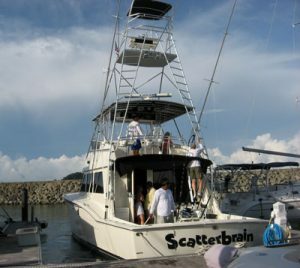 She has a MassPower generator; Furuno electronics and Navnet radar; a large salon with a full kitchen and flat screen TV; two marine heads; three sleeping quarters and four a/c Utils, along with Lee outriggers and Shimano reels with custom rods. She will do overnighters on request.